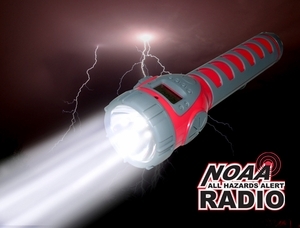 If you are worried about a black out, or just want the most features ever from a flashlight, the new Blackout NOAA from Viatek has everything you will ever need. NOAA Weather Radio All Hazards (NWR) is a nationwide network of radio stations broadcasting continuous weather information directly from a nearby National Weather Service office . NWR broadcasts National Weather Service warnings, watches, forecasts, PUBLIC ALERTS and other hazard information 24 hours a day. CEA defines Public Alert as a consumer electronics product providing direct access to government emergency information 24-hours-a-day, with the ability to automatically prompt users with various types of audio and visual cues. The products are sophisticated enough to recognize specific alerts for specific geographic regions, while monitoring emergency conditions at the state and national levels. All certified Public Alert devices meet the CEA standard for compatibility and certification, and receive free public broadcasts from NOAA Weather Radio network and Environment Canada's Meteorological Service of Canada Weatheradio network. •5 LED’s Super Bright White.